이 괘불은 1745년에 조성된 오불회도(五佛會圖) 형식의 괘불로서, 부석사에 전래되어 오던 1684년작 괘불을 청풍 신륵사로 이안하고 새롭게 조성한 것이다. 1684년작 괘불의 도상을 기본으로 하면서도 노사나불을 새롭게 첨가하였다. 즉 가로축으로는 비로자나불과 약사불, 아미타불을, 세로축으로는 비로자나불과 석가모니불, 노사나불을 배치하여 삼세·삼신의 오불회 형식을 취하고 있는데, 그 중심은 영산회상의 설주(說主)인 석가모니불이다. 이와 같은 삼신·삼세불화 형식은 일본 주린지(十輪寺) 소장 오불회도(15세기)와 안성 칠장사 오불회괘불탱(1628년)에서도 볼 수 있어 조선전기부터 나타나기 시작하여 조선후기에 정착한 도상임을 알 수 있다. 따라서 이러한 오불회 형식은 조선시대에 이르러 단행된 종단의 통폐합에 따른 삼신불, 삼세불 사상의 결합으로 나타난 도상으로, 이 괘불은 이러한 양상을 잘 보여주는 작품이다. 특히 대형의 군도형식의 불화임에도 불구하고 안정된 구도를 보이고 인물묘사에서도 부드럽고 자연스러운 필치를 보이는 등 18세기 중반경의 격조 높은 불화양식을 대변한다. 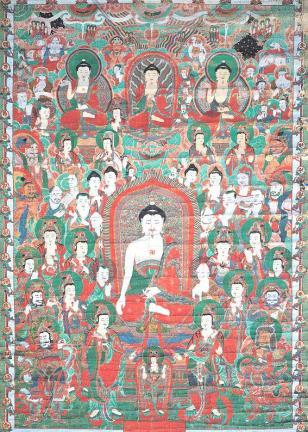 This hanging painting was created in 1745 based on an earlier work of 1684, when it was transferred to Silleuksa Temple in Cheongpung and another Buddha, Rocana, was added to form an iconography of five deities. The composition features Vairocana, Bhaisajyaguru, and Amitabha along a horizontal axis, and Vairocana, Sakyamuni, and Rocana along a vertical axis, thereby embodying faith in the Buddhas of the Three Ages as well as the threefold body of the Buddha, but throwing spotlight on Sakyamuni, the historical Buddha, as the principal teacher and preacher on Vulture Peak. Paintings of similar iconography are found at Jurinji Temple in Kyoto, Japan, and Chiljangsa Temple in Anseong, Gyeonggi-do; the former is dated to the 15th century, and the latter 1628. This type of iconography began to appear in the early Joseon Dynasty and took root in the latter part of the dynasty. The emergence of the iconography of five Buddhas was related with the mergers and abolitions of Buddhist denominations during the Joseon Dynasty. Despite its scale and diversity of figures, the painting shows a solid composition and smooth natural brushwork, especially in the depiction of human figures. The Painting is representative of the refined Buddhist painting style of the 18th century.